There’s a few times that I have met Mr. Miscavige, and first of all, I feel very honored to have met him. And each time I have met him, I really feel that he has all the time in the world for me. Even though I am sure he is so busy, talk about someone busy, he is very busy. About two years ago, I was talking to him and he inquired where my mother was. And she had been a little bit tired and had needed to go and take a rest. And he wanted to know if he needed to go to where she was and, and go and check up on her, if he should go and do that. And I had to really reassure him that it really wasn’t necessary, okay. But he is just so caring that, even someone who is slightly older who needs to rest the body, he was concerned and wanted to really make sure that she was fine. When my father passed away, David Miscavige wrote the most beautiful letter to my mother, and he sent her the most unbelievable bouquet, well it wasn’t even a bouquet, the hugest flower arrangement, and really acknowledged many years that my father had, had helped Mankind and done humanitarian activities. And it was just so moving, the acknowledgement that he gave my mother. And he didn’t need to do that, it wasn’t necessary; it was something he wanted to do. My family was going to be receiving this amazing award and we were really excited about it. And it was in England and my sister was in California and she was missing, and an hour or so before the award ceremony, she appeared and she had been flown in along with her husband, and I just cried, and cried and cried. I couldn’t believe it, my mother got completely emotional, and she was there with us, she came with us to receive the award, and it was complete because she was there. And about a year later, somebody told me that Mr. Miscavige had personally requested that she should be there. I knew that he had said she should be there and that he sorted it for her to come. But the fact that, for the fact that, when he had the hugest international event that he was delivering, he still thought of little details, like we would really like it if my sister was there, that was just so amazing. My son and his fiancée, a couple of years ago really wanted to marry in our Church, the Church of Scientology. And in England they couldn’t do that. It couldn’t be a legal wedding. And Chairman of the Board became aware of this situation and he personally took on an entire legal team to, to resolve this. It went to the Supreme Court. And the Supreme Court filed in our favor and we had the most spectacular wedding for them in our Church of Scientology of London. And Chairman of the Board sent them the most magnificent gift of Tiffany’s china, absolutely beautiful, and the most beautiful card thanking them for what they had done. And really it was what he had done. They had been able to marry in their Church because he had decided to take this on and put the time and effort and resources into allowing it to happen. He knows everything that is going on here. And I really feel that I have this personal communication line with him and when I let him know that something’s happening, I write to him or I talk to him, he’s always interested. He’s always got time. And I think, for me that’s so huge. He always has time despite so much that he deals with. I don’t think you can differentiate at all between David Miscavige the man and David Miscavige the leader. He, it’s the same person. 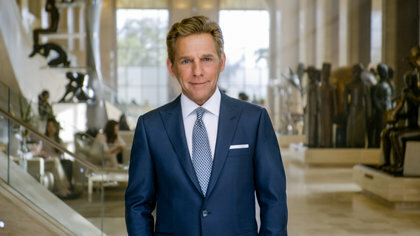 He doesn’t sort of quickly do a changing act, of like, “I’m going to change my cloak here and be David Miscavige the leader and lead the charge.” That is the man. He just cares. And he’s leading and I think he, you know, eats, sleeps, breathes what he’s doing. 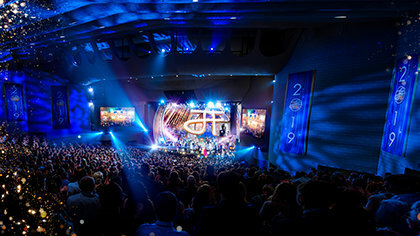 That is David Miscavige and, you know, whether it’s Chairman of the Board, David Miscavige, the man people call Dave, whatever, he is just this amazing person that you want to follow. But he’s not trying to be followed. He is just doing what he thinks is the right thing for humanity. And that is just amazing. He encourages us all to get out and, and help our neighbors and help people in our local community using Scientology because he really knows that this technology can help. And all he wants is for people to use it. That’s what he’s doing. He’s just getting out there because he wants to help people be more able and be happier in life. We are now a mainstream religion. And we are mainstream because we are out there. We are forward facing and we are helping people every day, because he’s there pushing the drive forward and just he is the ultimate leader. I would follow him absolutely anywhere to the end of the world. I would follow David Miscavige.